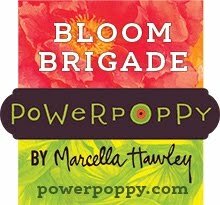 Hello Power Poppy fans! 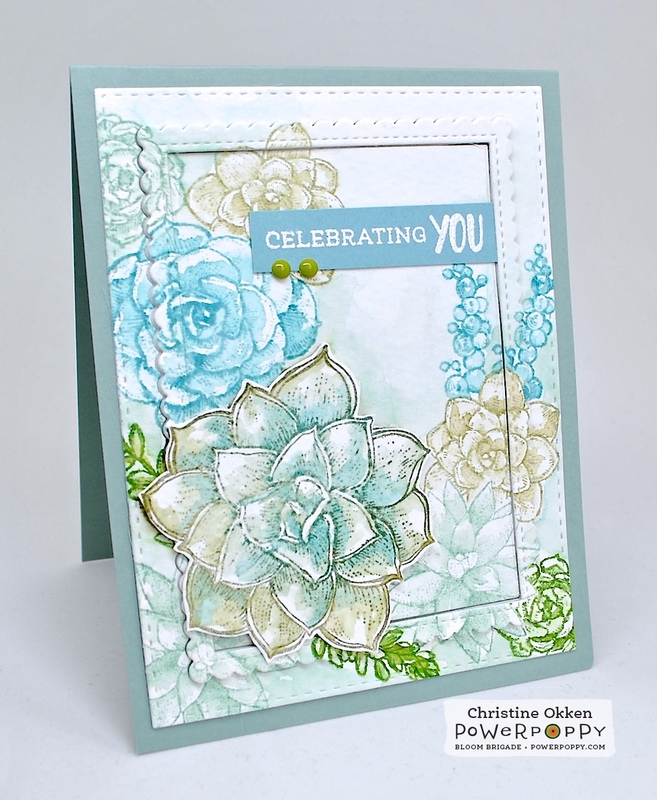 We’re back with our second day of Spring Fling releases, and today we’re going to show you two beautiful sets, Burst of Kindness and Succulent Singles. I’ve got a sweet little design using Succulent Singles. This stamp set is perfect for creating fabulous little mix and match groupings. The size and scale lends itself to layering and punchy visuals! Plus with it you’ll find a few fun sentiments. It’s such a fun, whimsical and dreamy set! I love the shades of blues and greens and purples that some succulents come in. So that cool palette is what inspired this card design. When I started card making, I often watercoloured, so for this card I went back to my roots and did some loose watercolouring. I started with the largest of the succulents and my Mini Misti, along with watercolor paper, some Eclipse masking tape, water based ink (mostly Stampin’ Up inks), and then put it all together piece by piece. Each time I’d stamp a succulent, I’d take my waterbrush and wash in some of the ink from the stamp and soften the lines. I also added a little ink from reinkers to bring some more colour to some of the succulents too. Then I’d do some masking and layer another little succulent in there. So, little by little the scene was formed. Once the entire image was stamped, I used some of my dies, stitched ones and scalloped frames to cut into the watercolour paper to give the card some dimension. Here you can see I popped up the inner scalloped layer to give some dimension, and then at the end, stamped a second large succulent image, watercolored it, trimmed it out and popped it up. With it being a very simple design, those little touches of dimension help give it some interest. I added a pretty sentiment, embossing it onto some Baja Breeze card stock with a couple of enamel dots to finish it off. Wonderful card Christine. The colours are so soft and serene...love it. Cheers. Just gorgeous! This set is going on my wish list! Christine this is so soft and beautiful! I like the way you created a succulent garden on paper. Awesome framing too! Just beautiful. Gorgeous! I want to try this technique. I'm a Copic girl and won't ever give them up, but I'd like to expand my horizons. Very inspiring! chance to win & for sharing your God-given talent. Loving the colors that you've used...another masterpiece! OH WOW! This is my favorite card!! I love everything about it!! 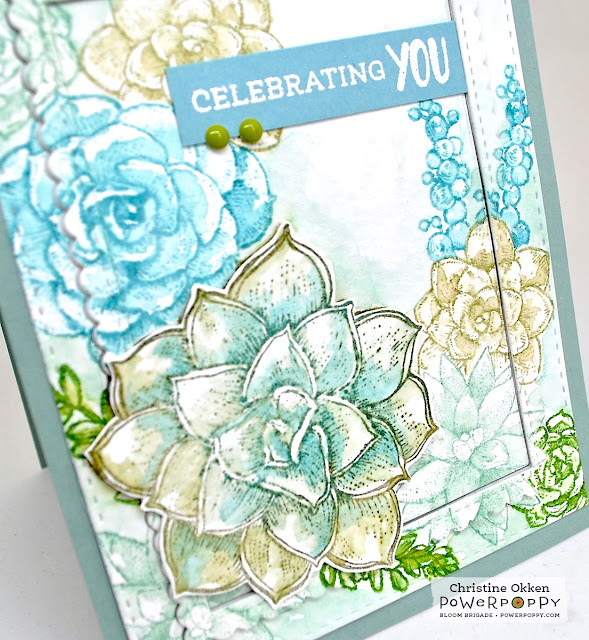 The way you stamped and watercolored is awesome!! The diecut layout is also soooo awesome!! The colors-awesome!! I can hardly wait for the release! !---and dies! What a fantastic design! They're all so Big and Bold and Beautiful! LOVE your colors! Beautiful dreamy softness, and with the frame hidden within -- brilliant! Who knew succulents could be so gorgeous? You're a master, Christine!